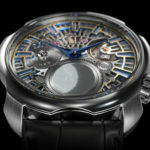 Sarpaneva Lunations is the very first Sarpaneva watch to house an ultra-precise integrated phases of the moon calibre that distils all 25 years of Stepan Sarpaneva’s professional watchmaking expertise. 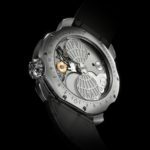 The lunation in the Sarpaneva Moonment® calibre lasts 29 days, 12 hours, 44 minutes and 2.3 seconds, which means it needs to be adjusted for a single day of error only once every 14,000 years. 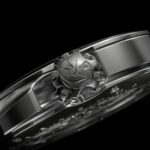 Pulling the crown at 4 o’clock out to the first position allows the wearer to set the phases of the moon display. 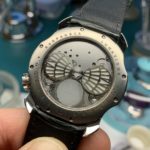 An integrated phases of the moon scale, engraved on the back of the watch provides additional guidance on getting the display as close to the actual lunar cycle as possible. 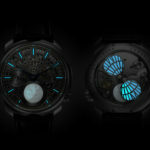 Sarpaneva Lunations can also be easily customized to reflect the lunar cycle in both northern and southern hemispheres. The story of Sarpaneva and Lunations. Lunations, is a long time goal for Stepan. 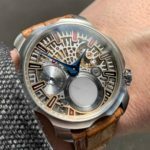 Stepan started his career at Kelloseppäkoulu, Finnish School of Watchmaking. Upon graduation, Stepan wanted more and he enrolled and was accepted to the prestigious WOSTEP school in Switzerland. 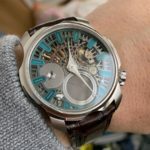 After WOSTEP, Stepan finds himself working for some very high end manufacture in Switzerland, yet he opts ultimately to return to Finland to found his own eponymous manufacture in 2003. Since,each series Stepan develops sees some new elements or techniques add to his already rich aesthetics and viewpoint. 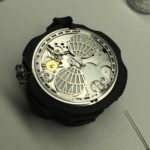 He’s become so well known for his “moon watches” that he really wanted his first complete manufacture caliber to be a “Moon Watch”. Stepan has a complicated relationship with the moon. Each moon cycle, Stepan finds restless nights as the moon waxes full to a full moon. The development of Lunations creates an ultimate endeavor to outlet restless energies and creativity. The goal is to create a masterwork, which idealizes the function of monitoring the Earth’s moon’s as it makes it’s way around it’s orbit of the Earth. 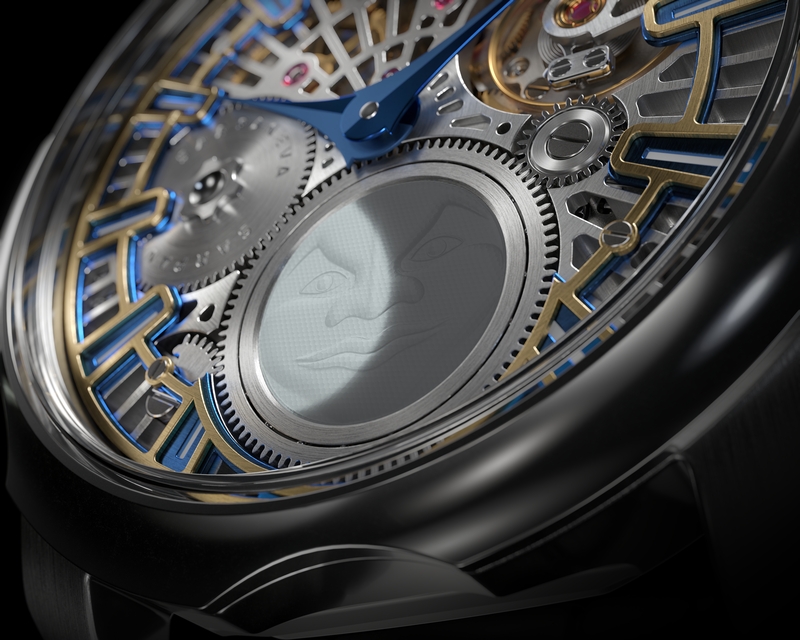 The calibre Sarpaneva Moonment itself is manufactured to optimize the cycle of the moon, 29 days, 12 hours, 44 minutes and 2.3 seconds. 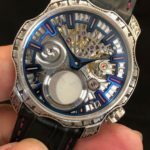 However, it should be explained that the Moonment, as one sees it mounted in the case, is actually “upside down” from the way a caliber would typically be mounted. 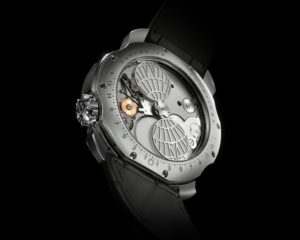 On the Moonment, the mainplate resides in “back”, seen through the caseback. 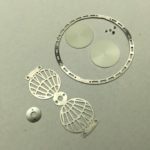 The “dial side” is then set to display the escapement in it’s entirety, most of the running train and part of the barrel. 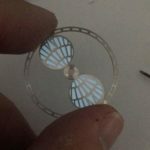 The “moon” indication is created first by a “moonface” made of tiny glass tubules, creating a fiber optic moon indication which is static in it’s setting. 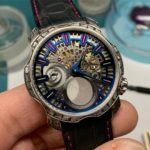 Then, a system at the back of the watch moves discs of Lumicast luminous pigment past the rear of the fiber optic moon to “illuminate” the moons visible “moonphase” mimicking the Earth’s actual moons’ interaction with our sun and the parabolic shadow of the Earth. The cycle, accurate to about 14,000 years before being a day off, is very easy to set. Sarpaneva has used the calculations of Andreas Strehler for the moonphase function, making Lunations the 2nd most accurate moonphase wristwatch ever produced. 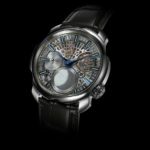 It’s 2nd only to Mr.Strehler’s own Lune Exacte . 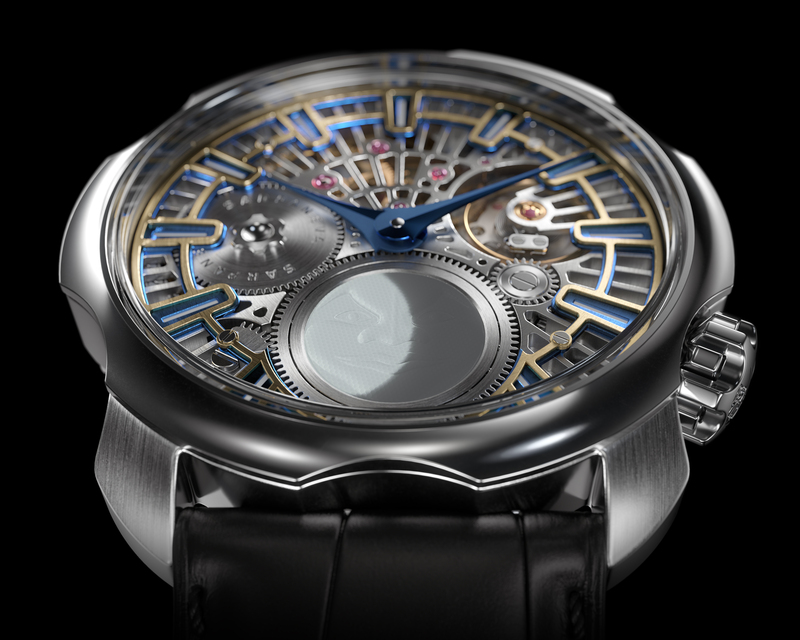 On the rear of the case the moon disks are supported by skeletonized frames mimicking Sarpaneva’s characteristic dial design. These frames feature large arrow shapes that point to the edge of the rear window, where along the case back edge a graduated scale is engraved around the bottom half. 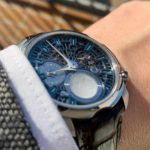 The scale, with zero at 6 o’clock, represents the 29.5 days of the lunar cycle, also called a lunation (hence the watch’s name), and has 14.5 days’ worth of graduations either side of the zero. The zero represents full moon; at new moon the arrows point to the ends of the scale. 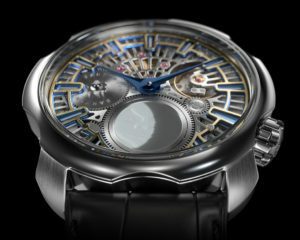 Through the caseback one sees the moon disks are supported by skeletonized frames . 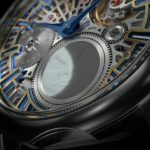 The frames have large arrow shapes that point to the edge of the sapphire display. 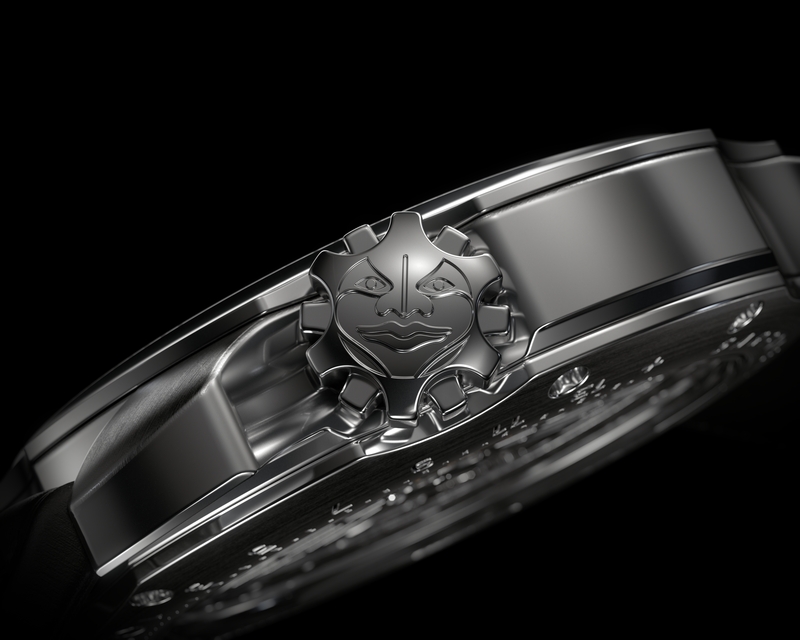 The arrows integrate with an engraved scale along the bottom edge of the caseback.The engraved scale represents the 29.5 days of the lunar cycle,or lunation. The scales’ center is “0” , then the scale graduates in either direction to show 14.5 days on either side of “0”. The scale starts with a new moon, waxing toward a full moon indicated at zero. As the moon wanes, the indications counts down 14.5 days to the next new moon…and it goes on again as it has since as long as beings have stared to the skies. How do I choose and order? 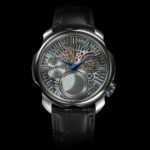 The case for this new watch is stainless steel in a 42mm diameter. The new case has a very familiar Sarpaneva silhouette, yet it’s completely new for this new masterwork. The aesthtetic choices for Lunations are varied. Each watch, invites input from the future owner. 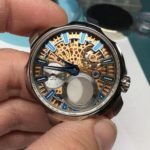 The color of the “dial”? The color of the outer chapters? The luminous markers? Perhaps, for the lucky few, the treat of a hand engraved case by master engraver,Joanne Ryall in England? The question begs, what do you want? 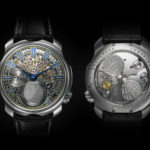 48,000 Euros -with a hand engraved case by Joanne Ryall. Copyright © 2012 Martin J. Pulli, Inc. All Rights Reserved.